With every new generation of young women, we see an advance in mindset that brings them one step closer to true freedom when it comes to choosing whatever careers they want. But recently I saw a shift so dramatic that I was truly rocked by it. When faced with a problem, each girl attacked it with total confidence. In an age where we hear of helicopter parents who resolve every problem for their children, and millennials who supposedly take no initiative, these girls didn’t hesitate or battle an inner demon of intimidation when they encountered problems – they just solved them! Achieving that mindset is a real game changer for a young person, especially for girls – because when you’re not waffling from within about whether you’re capable of tackling a problem, you can focus all that energy on actually solving it instead. Not only does that put girls on an even playing field with boys, it makes them more eager to show up to the game, participate and speak up without fear of failure, and gain the confidence to call the shots. 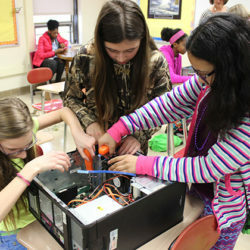 That doesn’t mean young women should be “just like the boys” when it comes to problem solving. It does mean that girls will thrive and gain confidence when we encourage them to stretch out of their comfort zones, participate in challenging activities and identify with female role models. This year at GETT, I saw it, and I can tell you…these girls GOT it!